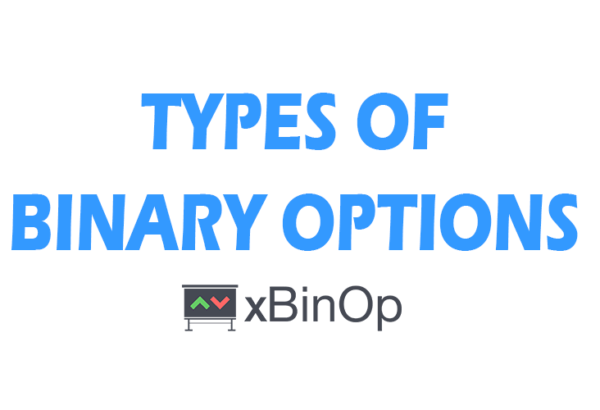 In the binary opions world, you will hear about many different types of options: Touch options and No-touch options, classic medium-term high-low options offered by all brokers, KIKO options by broker Stockpair, Ladder options (for example tradeable with Optiontrade) and many other. But which of these options is the best to trade? Why should you choose your broker broker just by the offered options and expiration times? In today’s article, we will look at ladder options and in the next episode, we will look at 60-second binary options. 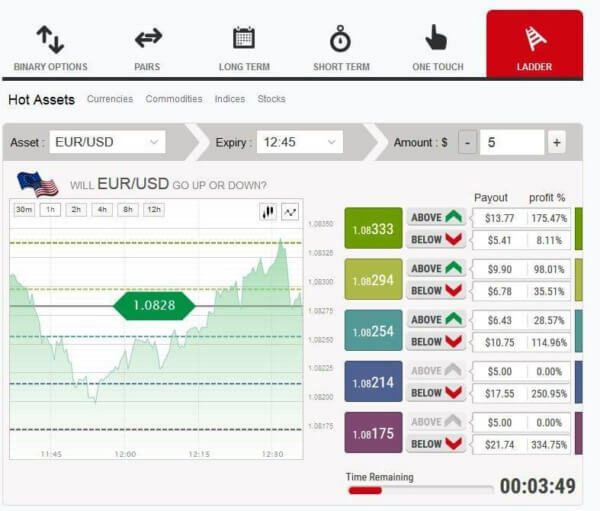 Ladder binary options are harder to understand than other types of options and therefore, I will try to explain everything in a simpler fashion. I’ll start with a picture. 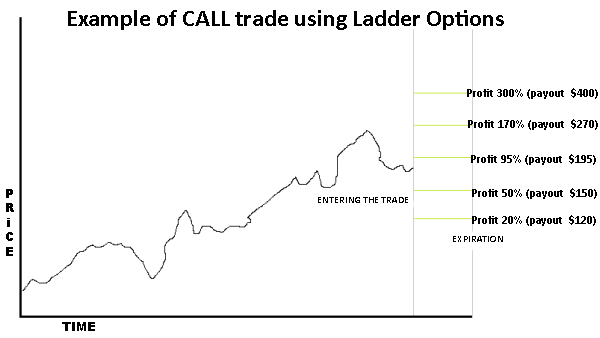 From the picture above, we can see how ladder options trading works. The trader speculates on the future price development, but this time the strike price is not set. So how does it work? Trading ladder options works by presetting some strike prices and afterward, we only speculate about whether the final price at expiration will be higher or lower than the set price. The current price at the expiration determines how much profit we get from the trade. Our model example: The current price of EUR / USD when using CALL trade had to overcome 14 pips upward for the trade to be profitable and earnings would be up to 98.01%. On the other hand, if we choose PUT trade, the trade is in-the-money since the beginning and we have 14 pips reserve. The expected earnings, however, are lower – only 35%. In the example above, we can see how everything works. A CALL trade with the amount of $100. According to the ladder on the right, we see that the profit increases in direct proportion to the risk associated with acquiring it. Thus, we earn more if we believe that the price is in a strong uptrend and gets even higher until expiration. I hope you understand. If not, leave me a comment here below the article and I’ll try to help you ;-). Ladder type binary options are indeed very interesting and often lucrative, but there are not many high-quality brokers who offer them. One of the brokers offering ladder options is BDSwiss and they are regulated. It is difficult to predict the price movements by X pips with such precision, as is the case with other types of options. On the other hand, that’s why it pays off if you do it right.